이 나한도는 16나한도 중 제7 존자인 가리가존자를 표현한 것으로, 의자에 앉아 고요하게 사색하는 이국적인 모습의 수행자를 수묵담채로 담담하게 담아내었는데, 바위와 수목을 배경으로 하는 고려 오백나한도와 확연히 구분되는 도상적 특징이다. 이 작품은 국토의 태평, 국왕의 장수 등을 발원하며 병신년에 그려진 것인데, 필선과 색채, 표현방식 등에서 1235년에서 1236년 사이에 제작된 고려 나한도와 거의 같은 내용과 형식을 갖추고 있다. 따라서 이 작품의 제작시기인 丙申年은 1236년으로, 다른 나한도와 마찬가지로 동량(棟梁) 김의인(金義仁) 등 무인들의 주도 하에 제작된 것임을 알 수 있다. 특히 이 불화가 제작될 당시는 몽고의 병란이 있었던 국가적 위기의 상황으로, 국난 시 크게 베풀어졌던 나한신앙과 직접적으로 연관되어 제작된 사례로 그 역사적 의의가 있다. 이 불화는 고려시대 제작된 나한도와 16나한도 중 몇 안 되는 작품 중 하나이며, 16나한도로서는 국립중앙박물관의 제15 아벌다존자와 이 작품이 유일하다. 현존하는 고려불화 중 13세기에 제작된 불화는 매우 드물고 특히 16나한도는 그 예가 거의 없어, 이 작품은 고려시대 16나한 신앙을 보여주는 중요한 예라고 할 수 있다. This ink wash painting of the Buddha’s disciple Kalika, the seventh of the sixteen arhats, depicts the Buddhist saint seated on a chair in profound meditation. The portrait is markedly different from Goryeo paintings of the five hundred arhats in which the saints are arranged against rocks and trees. 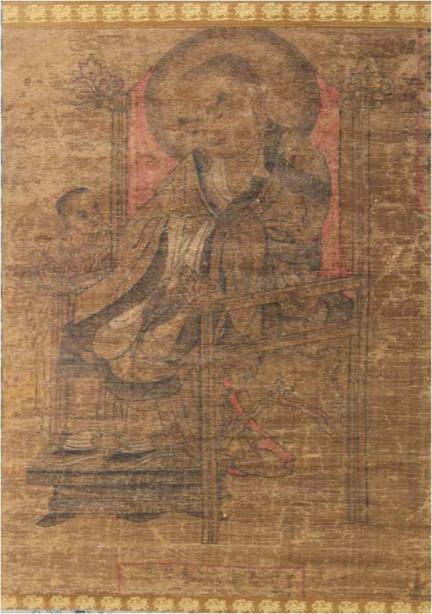 The painting is one of only a few extant arhat portraits created by Goryeo artists, and one of only two examples of sixteen-arhat paintings, the other being that of Ajita, the fifteenth arhat, which is currently in the collection of the National Museum of Korea in Seoul.